Casseroles are a big staple in our house as the weather gets colder and days darker (it is so dark when I leave work in the evening!). Ron and I are big fans of scalloped potatoes and ham, and I wanted to create a recipe that was inspired by this classic casserole but used hamburger. I also used pepper jack cheese alongside my cheddar for a little extra bite, but you can use a mild monterey jack cheese if you do not like pepper jack cheese. 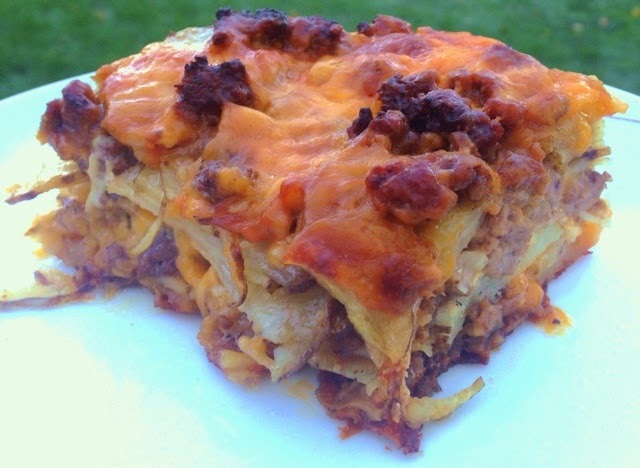 This was a big hit at our house and made tons of leftovers for work lunches. Kellen also really liked this meal . I wasn't surprised at all because he loves cheese and things with a little spice. I find with casseroles with raw potatoes that baking time can be inconsistent to get the potatoes done correctly. If you make this on a week night, be prepared that the baking time sometimes can be a little shorter or a little longer depending on when the potatoes are done. Today is election day across the country and make sure to get out and vote! If you are an older reader of mine you know that I worked on campaigns and in a Congressional office prior to my current job. Politics and elections are very important to me, and I have many friends in elected office and working on campaigns. I know how annoying the political calls, door knocks and mailers are (I get them too), but for many years I was on the other side of that call looking to talk to a voter about my candidate. Thank a volunteer or poll watcher today because they are taking the time to try and let you know why their candidate is important today, and tomorrow it will be all over. If you are in Appleton, it might just be me knocking on your door today doing GOVT for one of my best friends, Amanda Stuck. If you are in Green Bay it might be my mom poll watching for the League of Women Voters (Hi Mom!). Preheat oven to 350 degrees. Grease a 9 x 13 casserole dish with butter or cooking spray. Heat butter in a large skillet. Add onions and cook for 1 to 2 minutes. Add beef and cook till no longer pink. Remove from heat, drain excess fat and set aside. Whisk in flour, salt, garlic powder and black pepper with milk and cream until totally combined. Set aside. Using a mandoline (or kitchen knife), slice potatoes into 1/8-inch slices. Layer 1/3 of the potato slices in the casserole dish. Sprinkle on 1/3 of the beef mixture, then 1/3 of the cheeses, then pour on 1/3 of the cream and milk mixture. Repeat this twice more, ending with a sprinkling of cheese and a pouring on of the rest of the cream mixture. Cover dish with foil and bake for 60 minutes. Remove the foil and bake for an additional 20 minutes or until potatoes are tender.